A scene at the busy Maku'u Market located between Kea'au and Pahoa in Puna. Our recent visit to the huge Maku’u Farmers Market took place on a breezy but gloriously sunny Sunday morning. The market place was buzzing and the parking was ‘competitive’ with new arrivals waiting patiently for early birds to leave an empty spot…but the waiting didn’t take long as there was a steady stream of in-and-out, well-directed traffic. The market, managed by the Maku’u Farmers Market Corporation, is located on Hawaiian Homelands, makai of Highway 130 between Kea’au and Pahoa. Among the colorful ‘streets and avenues’ of this market, you will find almost a little bit of everything; produce, value-added food products, ready to eat, baked goods and preserves, dairy products, meats and seafood on occasion, as well as plants (both food producing and ornamentals), crafts, clothing, tools, antiques and garage sale items. We noticed this market has the largest variety of food producing trees and plants of all the markets we have visited to date. The market is used also as an educational tool for youth to learn business, technical and job skills. Providing financial education, educational scholarships and cultural classes, the market also has limited free space for school fundraisers, and community resources; and for outreach/demonstrations/schools/non-profits and entertainment. From time to time, free classes and demos are offered, such as info on fire ants; sustainability and many other topics of public concerns. This is also the only market we have visited so far that has a well defined “Food Court” with many vendors serving a variety of international foods; French Crepes, Mexican, Indian, Samoan, Greek and Thai. There is also a large tent with picnic tables adjacent to a stage set-up for the continuous live entertainment. Anita says her best selling products seem to be jams, cinnamon rolls, banana bread and her sandwich bread. 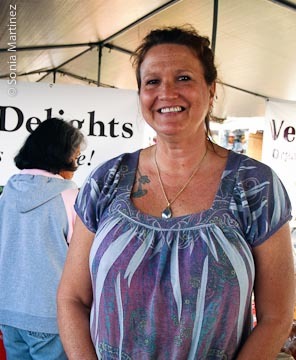 “I sell my breads at Abundant Life, Keaau Natural Foods, and Down to Earth. I also sell bread to Kaleo’s, Black Rock Café, and to Ponds Restaurant. I sell my jams at KTA, Hilo airport, Kona airport, Honolulu Airport, and Down to Earth. Anita enjoys sharing her products one on one and talking story. She especially loves repeat customers since they validate the joy she feels when she is creating what she sells. Zach Stacey Taylor of Puna Goat Cheese. Puna Goat Cheese is a product of the 9-acre Lava Rocks Farms in Hawaiian Acres in the Kurtistown area. 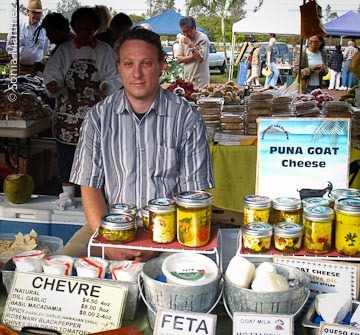 Owned and operated by the husband and wife team of Steve Sayre and Lava Stacey, they have been selling 100% goat milk chevre, feta, queso fresco, ricotta and mozzarella at this market for the last 4 years. They also produce goat milk soaps and from time to time have baby goats for sale. The first goat cheese farm in the state of Hawai’i, Lava Rocks Farm was originally established in 1984; it temporarily stopped production in 2000, and after reorganizing started operations again in 2005. At this point Steve and Lava are a little over the halfway mark of a 10- year plan to achieve at least 50% sustainability. "We’re very committed to the slow food movement and are mostly interested in making small quantities of artisan goat cheeses," Stacey says. Their best selling product at the moment seems to be the goat cheese sold in jars filled with olive oil and herbs. You can find their products sold at many island markets and served at the most posh restaurants. Tamales at Carlos Mojica's booth. We found Carlos Mojica of Kea’au by the delicious aroma wafting from his booth. Carlos and his wife Virginia own and operate Lucia’s Mexican Food, and have been serving chicken and cheese Jalapeño tamales along with Mexican rice, refried beans and their special hot sauce for six years. 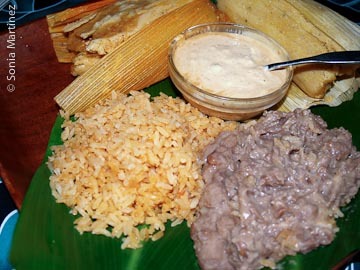 After samplng bits of both types of tamales, we could not make up our minds -- so ended up ordering both kinds. I thought the Jalapeño was going to be too hot for my taste, but was pleasantly surprised that although hot, there was a nice balance between the ‘picante’ and the cheese. At Carlos’ suggestion, we added a bit of sour cream to the sauce. Besides the food, they also serve iced cold Jugo de Jamaica (a red hibiscus drink very popular in Mexico) and Jugo de Piña (pineapple juice). Carlos is a very personable and friendly young man and we spent a nice time talking story with him. Pali and Anjali Kala at Kalas Indian Cuisine. Pali and Anjali Kala were busy cooking and dishing up home-style Indian food at their Kala’s Indian Cuisine booth. They always offer at least one vegetarian and one non-veggie dish each market day. On the menu that morning were veggie samosas and chicken curry. The samosas were being sold as fast as Pali was making them. Eating piping hot crusty chick pea and potato samosas seasoned with a touch of garam masala and a hint of cumin and served with a bit of cooling yogurt, cucumber and mint raita. . . . It can’t get any better than that! 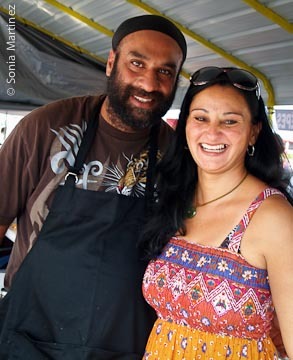 Pali and Anjali moved to Hawai’i eight months ago from Cleveland where they ran a family Indian Cuisine business for 15 years. They have been selling at the Maku’u market for 7 months and hope to expand to other nearby markets soon. Pali remarks that they love to hear people say they’ve been waiting for years for good and simple Indian food to come to Maku’u Market. He and Anjali are very happy to share “curry joy” with all who drop by their booth. This is not only our largest island market, but a very busy and eclectic one. As one vendor stated, it’s a craft and food and garden and flea market wrapped into one. Plus it has live music and covered seating for eating and socializing. A true gathering of kama'aina.